Match ends, Cyprus 0, Belgium 2. 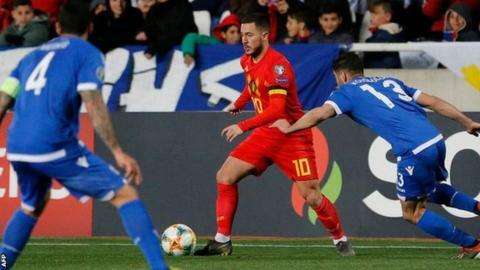 Second Half ends, Cyprus 0, Belgium 2. Offside, Cyprus. Kostas Laifis tries a through ball, but Fotis Papoulis is caught offside. Foul by Leander Dendoncker (Belgium). Anthony Georgiou (Cyprus) wins a free kick on the right wing. Substitution, Belgium. Dennis Praet replaces Michy Batshuayi. Kostas Laifis (Cyprus) hits the bar with a header from the centre of the box. Assisted by Matija Spoljaric with a cross following a set piece situation. Foul by Yannick Carrasco (Belgium). Foul by Michy Batshuayi (Belgium). Kostas Laifis (Cyprus) wins a free kick in the defensive half. Ioannis Kousoulos (Cyprus) wins a free kick in the defensive half. Attempt missed. Ioannis Kousoulos (Cyprus) left footed shot from outside the box is high and wide to the left. Substitution, Cyprus. Andreas Makris replaces Minas Antoniou. Attempt blocked. Renato Margaça (Cyprus) left footed shot from outside the box is blocked. Assisted by Fotis Papoulis. Attempt saved. Yannick Carrasco (Belgium) right footed shot from the left side of the box is saved in the bottom left corner. Assisted by Jan Vertonghen with a headed pass. Yannick Carrasco (Belgium) wins a free kick in the defensive half. Foul by Renato Margaça (Cyprus). Substitution, Cyprus. Matija Spoljaric replaces Georgios Efrem. Attempt missed. Adnan Januzaj (Belgium) left footed shot from outside the box is high and wide to the left. Assisted by Timothy Castagne. Attempt missed. Fotis Papoulis (Cyprus) right footed shot from outside the box is close, but misses to the right. Assisted by Kostakis Artymatas. Substitution, Belgium. Yannick Carrasco replaces Thorgan Hazard. Attempt saved. Michy Batshuayi (Belgium) left footed shot from the centre of the box is saved in the bottom right corner. Assisted by Eden Hazard with a through ball. Offside, Belgium. Leander Dendoncker tries a through ball, but Thorgan Hazard is caught offside. Foul by Timothy Castagne (Belgium). Georgios Efrem (Cyprus) wins a free kick in the defensive half. Substitution, Belgium. Adnan Januzaj replaces Dries Mertens. Toby Alderweireld (Belgium) wins a free kick on the right wing. Attempt missed. Youri Tielemans (Belgium) right footed shot from outside the box is close, but misses to the right. Assisted by Michy Batshuayi. Foul by Ioannis Kousoulos (Cyprus). Foul by Youri Tielemans (Belgium). Minas Antoniou (Cyprus) wins a free kick in the attacking half. Attempt missed. Timothy Castagne (Belgium) right footed shot from the right side of the box misses to the left. Assisted by Youri Tielemans. Dries Mertens (Belgium) wins a free kick on the right wing. Foul by Nikolas Ioannou (Cyprus).